The Yosemite National Park in the Sierra Nevada in California is a fine example of a natural, unspoiled environment. Highlights include the huge, ancient sequoias and the granite cliffs of El Capitan. 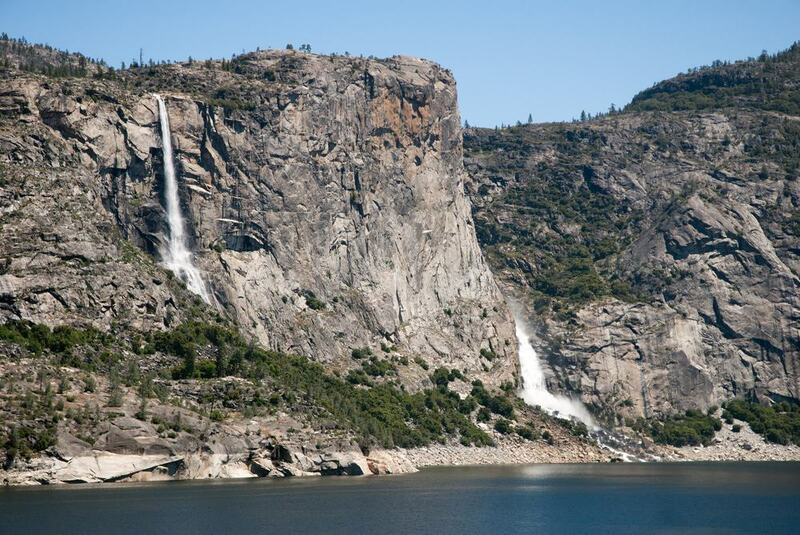 Yosemite has been formed by glacial activity over millions of years and small glaciers still exist. Waterfalls are found throughout the park, some extremely impressive. Most vary by season, with mid-summer seeing many dry up, while in mid-winter they appear to freeze solid. 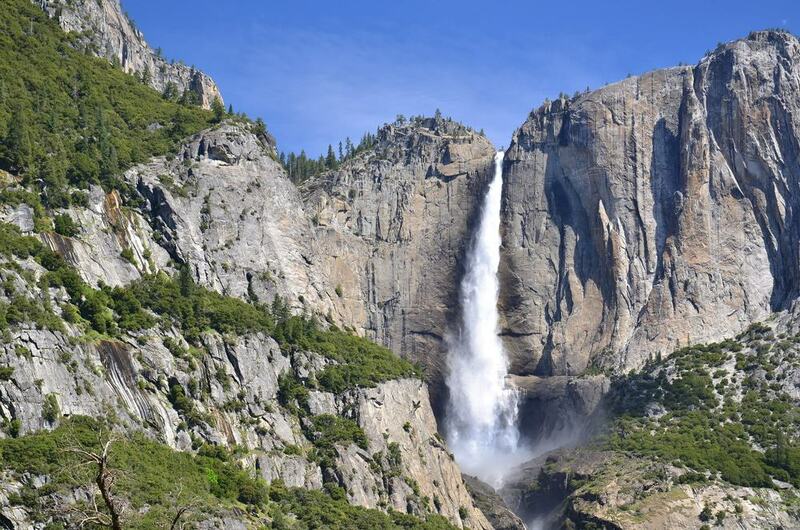 If you have a choice of when to visit Yosemite and you wish to see the falls at their best, spring is when they are in full flow as the snows melt. 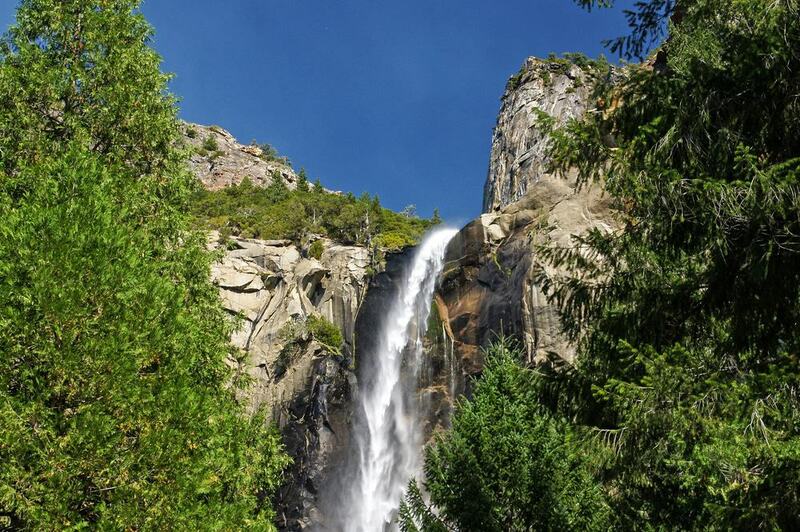 As a guide to which you should priorities on your visit, here are 15 amazing waterfalls in Yosemite. The two sections of Yosemite Falls pour over the cliffs for a total of 1850 feet, with a 675-foot cascade between the upper section – 1,430 feet – and the lower one – 320 feet. They are easily the highest North American Falls, as well as being in the world’s top 10. In mid-summer, you may be almost deprived of seeing them at all because they shrink to a trickle. In the height of winter, they can be solid ice. You can capture a rainbow in your photograph and a ‘’moonbow’’ by night when they are in full flow. Glacier Point is a good vantage place and there is a trail to their base. Yosemite Falls dwarf the nearby Lehamite Falls, which form a high but thin cascade of water in Indian Canyon. Spring is most definitely the time to see Lehamite as the snows are melting. Even then, the trees cast a shadow over the falls after mid-afternoon, rendering them almost invisible, so bear that in mind if you want to get some great photos. The best place to view them is from a distance, in Cook Meadow near the old Yosemite Village. Another alternative – though again at a distance – is the Swinging Bridge in the west. An impressive 2,000 feet, Sentinel can start to flow strongly from March until June in a series of steps. The highest single drop is approximately 500 feet. It gets minimal attention despite its height, because of the many attractions of Yosemite – including the Yosemite Falls themselves. It gets its name from the nearby towering Sentinel Rock and has its source at Pothole Meadows. 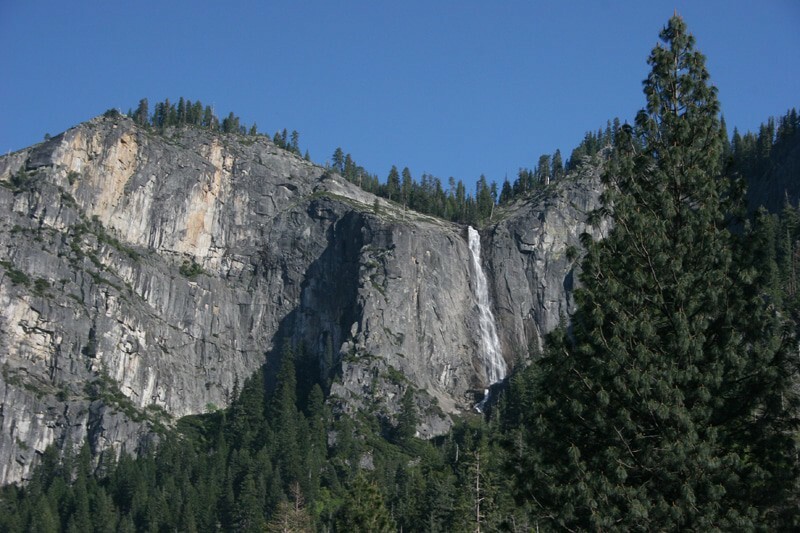 Sentinal Falls are visible from the valley, where there is the Sentinel Beach Picnic Area, or while you are on the Upper Yosemite Falls Trail. 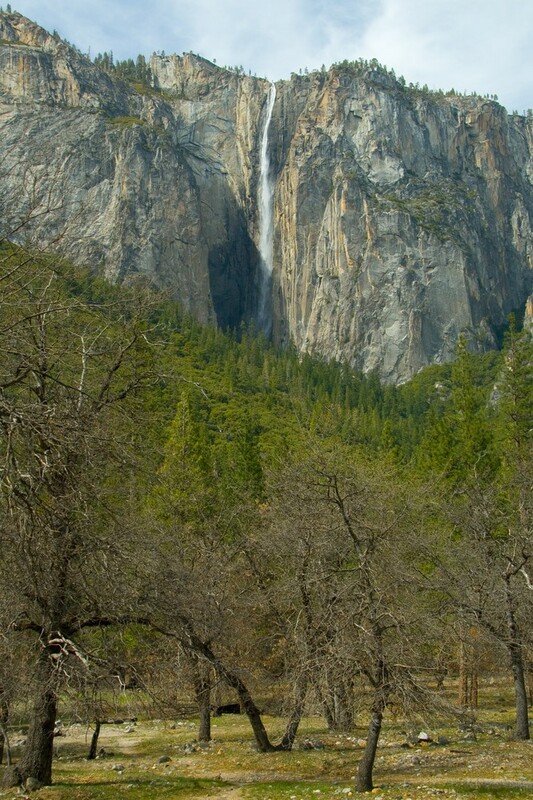 The setting of Bridalveil Fall across from El Capitan is simply stunning. It is the first waterfall you see as you enter the Park. Its height is almost 620 feet and it flows all year round. The Ahwahneechee Indians call it Pohono – ‘’Spirit of the Puffing Wind’’ – because the water appears to drop sideways in strong winds. You can easily get to the base in a few minutes but you will be walking up a fairly steep slope. Tunnel View on Highway 41 is another place where you can get a different view of the waterfall. Silver Strand Falls hardly get noticed because they are at Tunnel View Overlook. 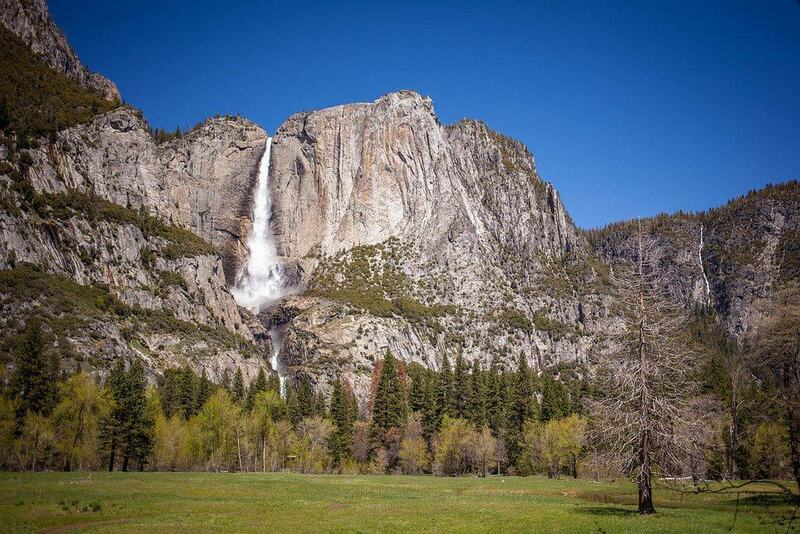 Visitors only seem to have eyes for El Capitan and Bridalveil Fall. They rarely look up unless they are serious waterfall lovers and the falls are in their itinerary. 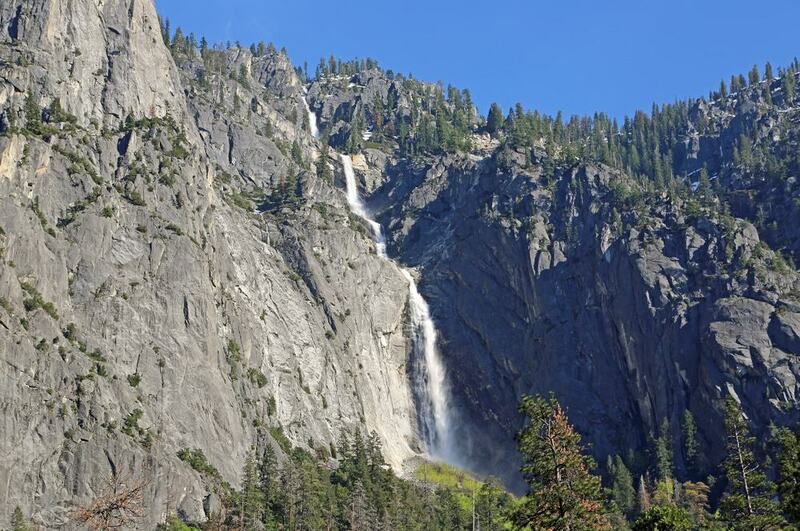 The western-most of the falls in Yosemite, Silver Strand’s water comes from a basin near Badger Pass. Its season is fairly brief from the snow melt until summer, though few park visitors seem to care too much because of the number of wonderful landscapes on view. Ribbon Fall is the highest single drop waterfall in North America at over 1,600 feet. Despite its height, it is another that gets less attention than it deserves because there is so much beauty around. Its season is also brief – sometimes just when the snows melt until June. It is just past Bridalveil, flowing over the western side of El Capitan down to a high amphitheater of vertical cliffs. You can stand below the cliffs and look up at the waterfall without there being a recognized trail to it. Photograph it early morning or late afternoon when the sun is directly on it. Nevada Fall is just short of 600 feet and flows all year round because it is fed by the Merced River. The water hits rocks and, as a result, appears to be white, which is why it got its name; Nevada means “snow-covered” in Spanish, while Native Americans call it Yo-wy-we because of the twisting water as it falls. Glacier Point is again a good vantage position but it is at some distance. Continue on and you will come across the Emerald Pool before your next waterfall. Your photograph at that spot will seem to be a giant staircase cascading down. That next waterfall is called Vernal and it flows all year round, although its peak is the end of May. As the weeks move on, it splits into two or three separate falls as the flow reduces. 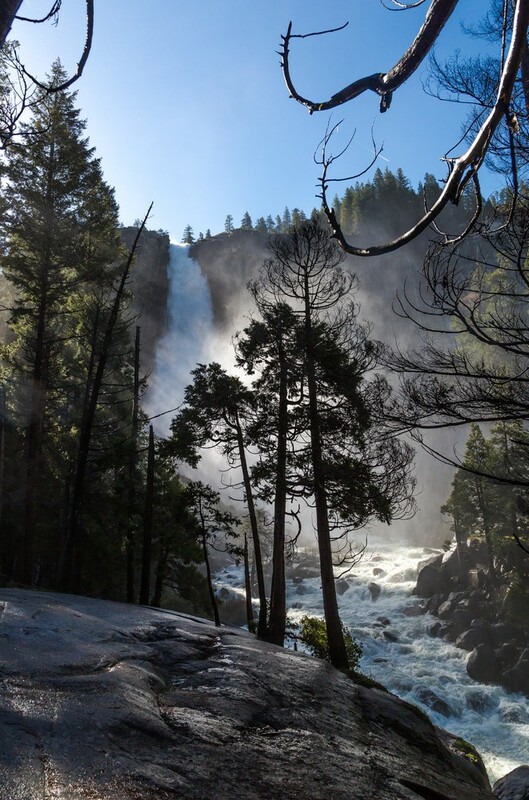 You can hike to this 320-foot waterfall, although the Mist Trail is fairly steep. It is open in the winter unless it gets really icy. 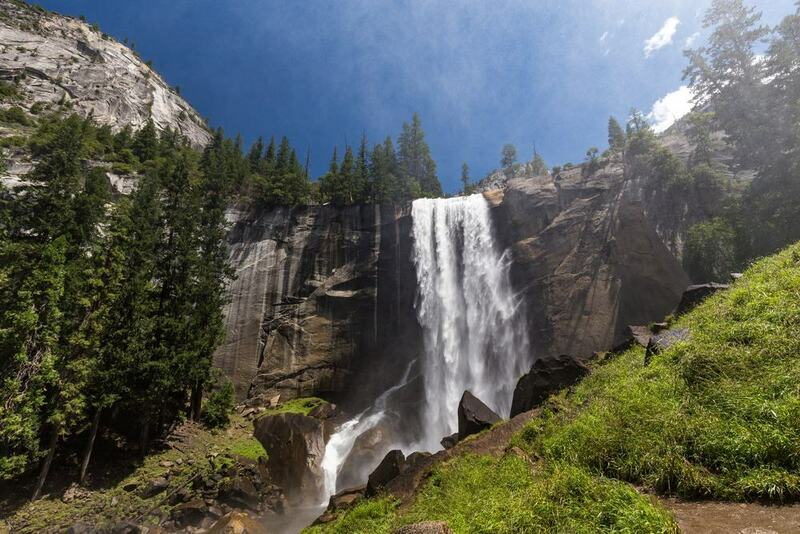 Vernal is one of the really powerful waterfalls in Yosemite. Glacier Point is somewhat distant, but you can see it from there once the road opens, usually towards the end of May until November. It is possible to get to Glacial Point with a wheelchair during that time. 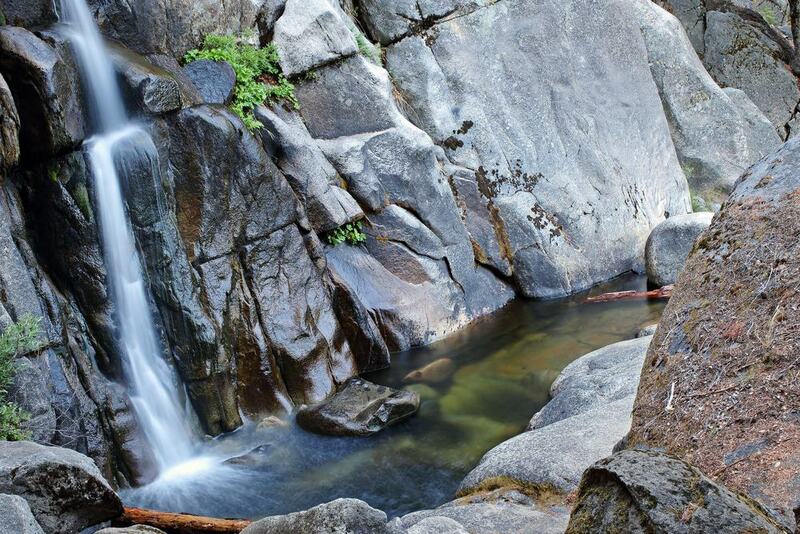 At 370 feet and flowing all year round, you will come across this waterfall when you are on your way to Vernal Fall. It is best seen from the Panorama Trail, which is fairly steep. The round trip is about four miles, though if you go to Panorama Point it is 5.6 miles. Just before you reach the top of the waterfall, there are some impressive cascades with rock platforms intruding into the water where you can sit and even picnic. You will not be able to see it from the road, so be prepared for some exercise. The difference about Horsetail is that it is at its peak in the winter, between December and April. It can be dry for much of the year, but when it flows, it takes on the shape of a horse’s tail. At times, the sun shining on it turns everything orange as it sets. If you want to catch that, pick a sunny winter’s day towards the end of February. A famous 1973 photograph captured this phenomenon wonderfully. 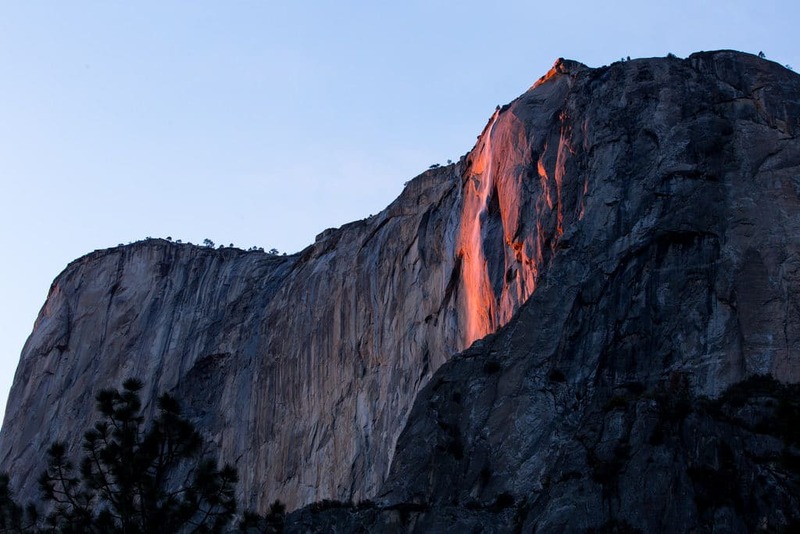 If you can match it, you will have a stunning photograph in your album of Yosemite. You can see these Falls from the road at O’Shaughnessy Dam, although whether that is the reason why few bother to walk there is frankly unknown. It is a powerful waterfall – 1,400 high – which is at its best at the end of May, although it flows all year round. Before the dam was built, the falls were 400 feet higher. At full flow, the water can cover the bridge on the trail, which is therefore closed. At other times, you can stand on the bridge and get a shower with your clothes on; on a hot day, it is most refreshing. The hike to the falls is a round trip of 5.5 miles. Not so high as Wapama, Tueelala are still impressive at approximately 880 feet, and it is in a single drop. They can dry up, and if that happens, it can be late spring or early summer, depending on the snow at winter and the speed of its melting. Certainly, there will be nothing to see in mid-summer. At its full flow, it may actually cause flooding in the immediate area. If it is flowing strongly, it is likely that the trail further down to Wapama will be flooded. Anything else and you can safely proceed. You cannot see Chilnualna from the road, and the route the water takes is such that the whole of the falls is not visible from a single spot because it twists and turns. The series of tiers on Chilnualna Creek vary from 30 feet to 240 feet. The falls are of an indeterminate height and flow throughout the year, with the peak usually in May. The trail takes you to the top of the falls, but you must realize that it is a steep uphill trek uphill will take a few hours there and back. The view from the trail is from around a quarter of a mile away. 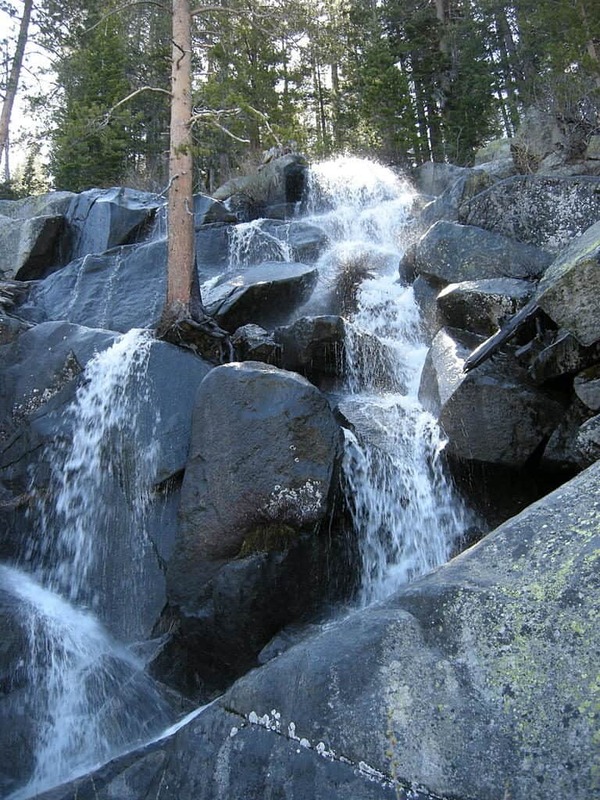 Often called Slide Falls, this waterfall is at the head of Tenaya Canyon. It is difficult to measure its exact height, though best estimates are about 600 feet. It is difficult to get a good view of the falls, and the trail is not easy, so it has not become an especially popular spot with visitors to the park. Its source is Lake Tenaya but it is still seasonal and you will need to go in the spring to ensure a decent flow. There is a distant view of the cascade from Glacier Point, or you face a trek of six miles in all to get to the canyon overlook and back. 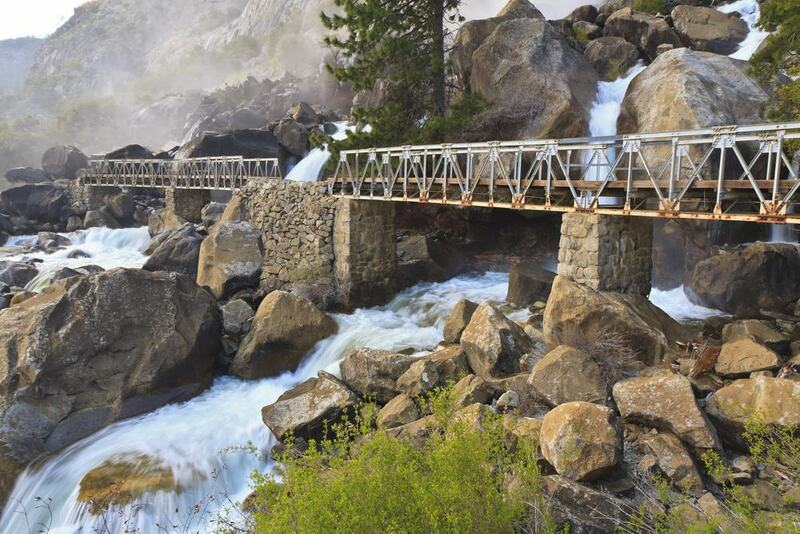 The falls are just 25 feet and visible from the Tioga Pass Road. Its flow is minimal in the height of summer, though the creek above and below runs throughout the whole year. It is the melting snow that results in its strongest weeks and the drainage area is not especially large. There are multiple strands to the falls, which receive few visitors even though the air is so fresh at the altitude. 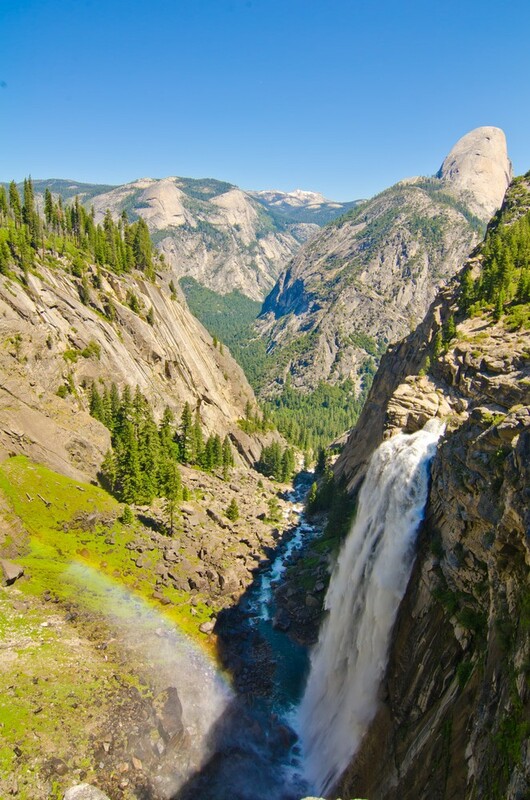 The competition with the larger falls in Yosemite means that these falls – also known as Tioga Pass Falls – are little-visited.